On 6 June, in the municipal house of the city of The Hague, a roundtable debate took place, entitled ‘Towards a new parliament? The European Parliament after the 2014 elections‘. The invited speakers featured both prominent academics like Christophe Crombez (Stanford University/University of Leuven) and Claes de Vrees (Univeristy of Amsterdam), politicians like Wim van de Camp (a Member of the European Parliament from the Christian Democrats), and the expert Tom de Bruijn (former Permanent Representative of the Netherlands to the EU and current member of the Dutch Council of State, also an external teaching Fellow at the Institute of Public Administration). The debate was organized by the Institute of Public Administration of Leiden University and the Standing Group of the European Union of the European Consortium for Political Science Research (ECPR) with the support of the European Commission Representation to the Netherlands, the Dutch Minisitry of Foreign Affairs and the Hague municipality which co-sponsored the debate. The roundtable took place in the large atrium of the municipality, while somewhere upstairs negotiations on the new city government were still under way. Most of the public were academics – the debate was part of the 7th Pan-European Conference on the EU – but, quite amazingly, people from all walks of life showed up as well – from secondary school students to journalists to retired civil servants. If anything, the full hall and lively discussion showed that debating the future of Europe with a broader public is not only necessary, but also possible. 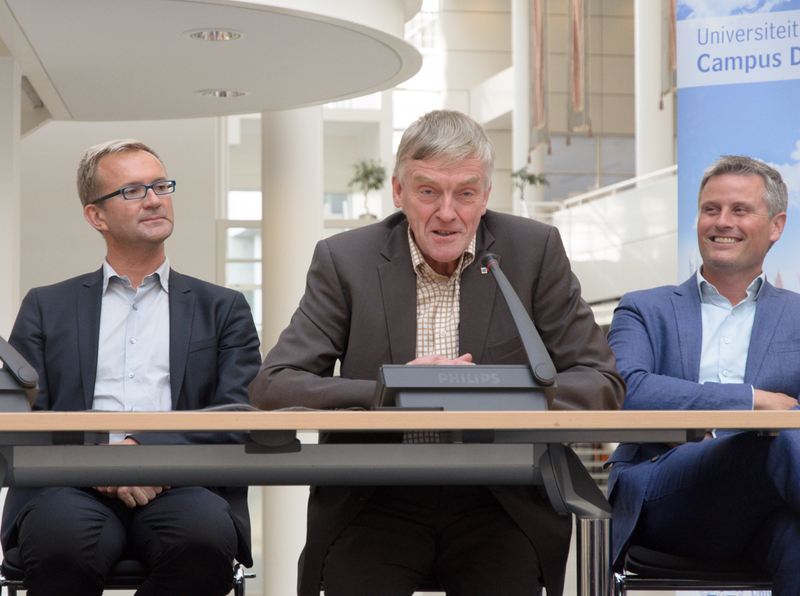 The moderator, Joop Hazenberg, asked a number of questions about the speakers’ assessment of the results of the European Parliament elections, their vision of the future priorities and the future President of the Commission. Then there were questions from the floor. Two of the speakers – Crombez and de Vreese were more positive than many may have expected on the entry of populist parties in the European parliament, rightly observing that these parties represent views that also have their place and are healthy for the debate. Van de Camp suggested that low turnout in EP elections is the result of lack of education on the EU in secondary schools, a view which was challenged by a member of the audience who was a secondary school pupil. De Vreese shared results from his public opinion work which suggest that even more liberal parts of the Dutch electorate are negative towards some member states citizens. This left the audience wondering what the current views and expectations of the Dutch public are with regard to the Internal market. Van de Camp was quite optimistic about Dutch companies taking advantage of the final opening of the market for services, yet did not respond to questions on how this would affect the free movement of labour in the Netherlands. De Bruijn highlighted a common energy policy as an urgent priority for Europe. The questions touched on EMU, human rights and the EU, internal market and the selection of the new Commission president. On the latter, the members of the panel were divided: while Crombez felt that making Mr. Juncker the next Commission President would strengthen democracy in the EU, de Brujin pointed out that Mr Juncker was not even on the list of the European People’s Party candidates. With this, a lively debate was finished as one of the highlights of an even livelier conference. This format mixing politicians and academics and using a public venue seems to hold some promise for all involved: academics, politicians, experts and the public.The very exchange of views is creating a better awareness where democracy in the EU is weak and what we can do to change this.